Vegan Street Fair returns to Los Angeles on March 23 and 24, extending to two full days for the first time in its five-year run. 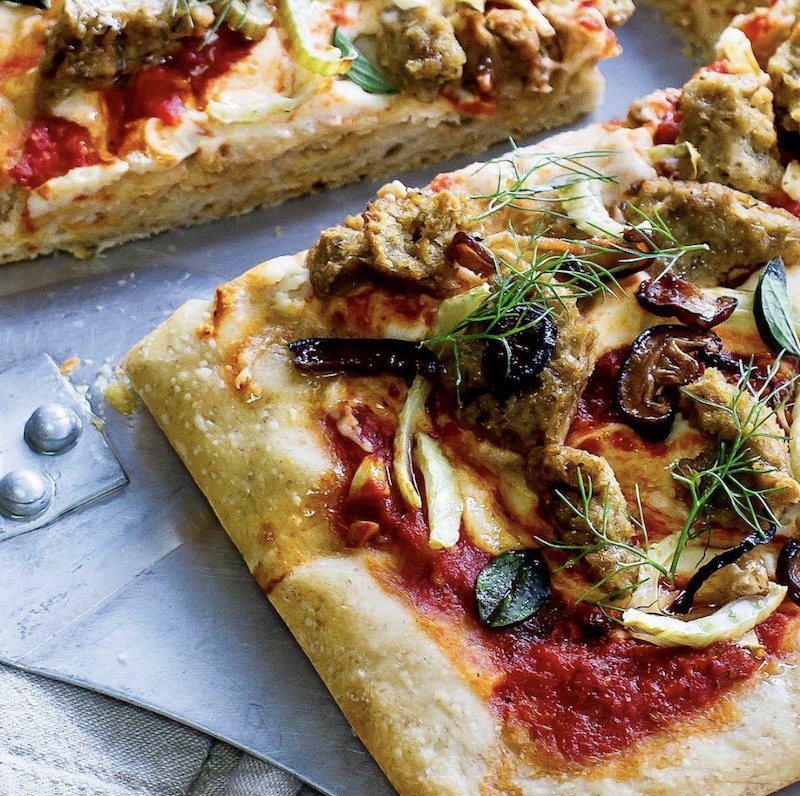 It is one of the most anticipated and highly attended vegan food events in the Southern California area, attracting over 150 vendors and an expected 35,000 attendees, according to founder Jessica Schoech. The free community event entices both locals and guests from other neighboring counties, all vying to get the perfect Instagram shot before noshing on outrageous vegan eats. Lines can be long and vendors often run out early; plan your day accordingly and don’t miss these 17 Instagram-worthy bites. The Pizza Plant’s head-turning, bright green, tour bus-sized pizza truck churns out equally eye-popping pizzas. Take a bite out of The Sink Not Included, a vegan meat-lovers’ pie with housemade sausage and pepperoni, bell peppers, onion, black olives, cashew and mozzarella cheeses, San Marzano marinara, and fresh oregano. Don’t forget to snap a photo before you dive in! What’s better than vegan mac and cheese? Mac and cheese on wheels. 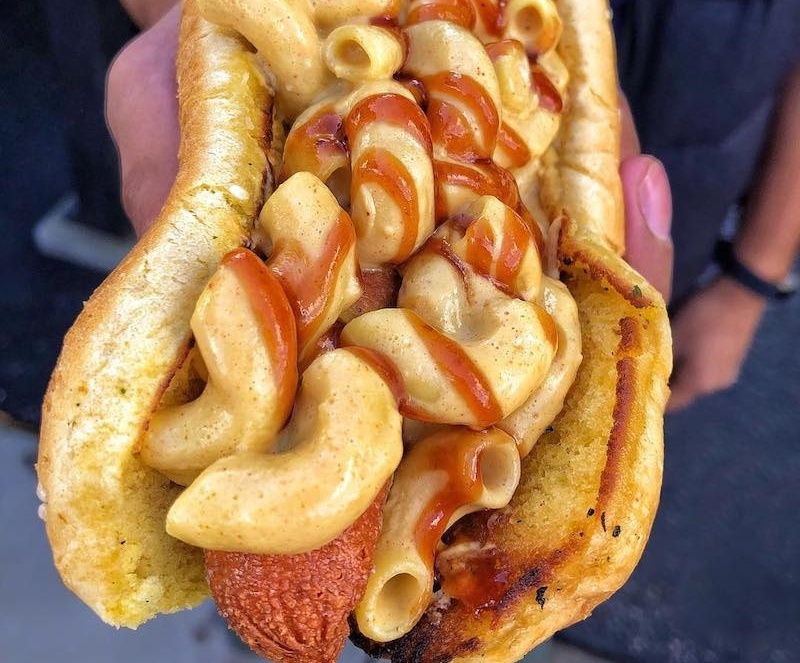 Roni Macaroni is rolling into Vegan Street Fair with a menu including Buffalo Tofu Mac Fries, BBQ Pulled Pork MacFries, Buffalo Mac and Cheese, Apple-Sage and Mushroom Mac and Cheese, and the famous Roni Dog—a deep-fried vegan hot dog topped with a nut-free vegan mac and cheese, drizzled with barbecue sauce, and served with a side of fries. Co-owners Lynn and Enrique created Eat Love to provide plant-based food with all the flavor and none of the processed stuff. 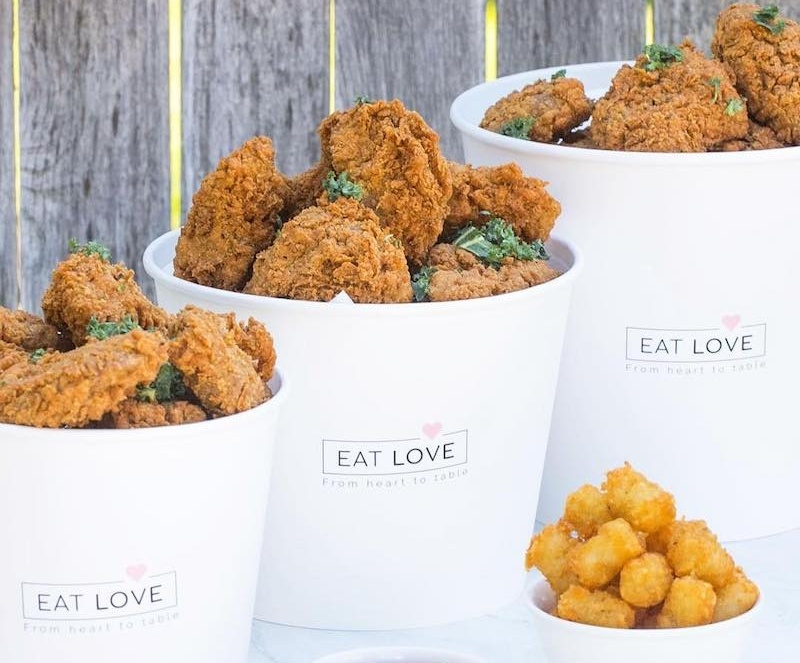 While the Waffle Sandwich, limited edition UFO Ice Cream Sandwich, and the Waffle Chick’n Cone are all social media-worthy, the signature Buckets of Chick’n is a must. Just be sure to hashtag “vegan,” or your friends might think it’s animal-based! Introducing the Hot Chik’n Sando—a mashup up of southern and Creole cuisine resulting in a spicy, finger-licking-good sandwich. 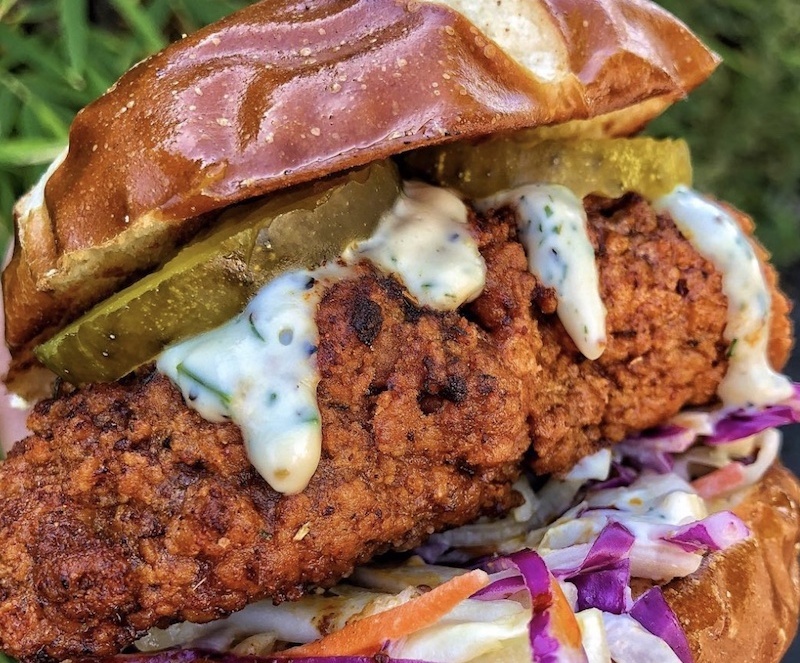 Capture the soft buttery bun, crispy cool apple slaw, hot vegan fried chicken, pickles, and plant-based buttermilk as it oozes out of the sides in an Instagram post. Your followers will have serious FOMO. Hailing all the way from Detroit, you’ve got a unique opportunity to document Street Beet’s eats on your profile. While everything on its menu is impressive, the Chicken & Mac Waffle Cone cannot be ignored. 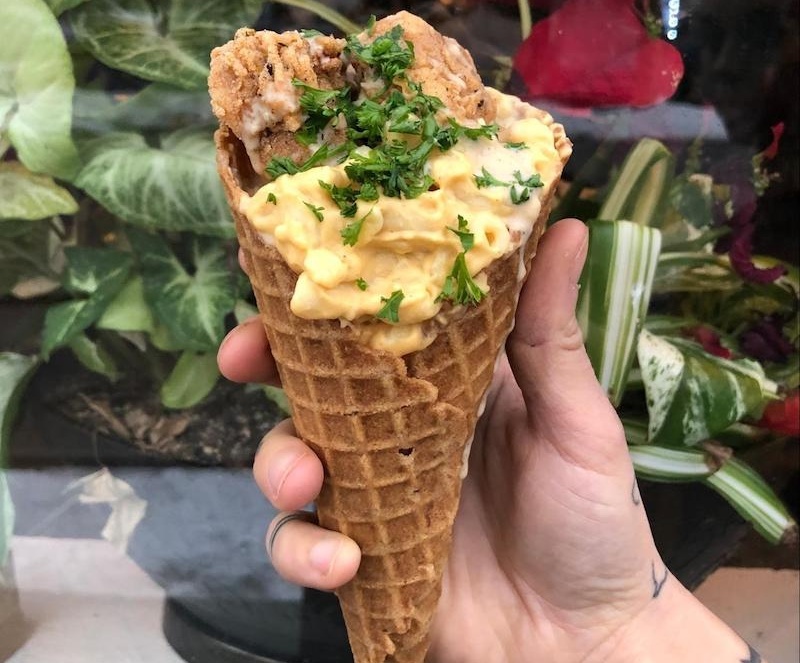 The homemade gluten-free waffle cone is stuffed with creamy smoked cheddar mac and cheese and crispy vegan chicken, all drizzled with gravy aioli. This is the most satisfying and portable comfort food we’ve ever seen. Don’t be fooled by the name; this vegan vendor is all about mac and cheese (with avocado on top, of course). Any one of its tricked-out cheesy creations are Instagram-ready, from the Curry Mac to the Taco Jalapeño Mac. 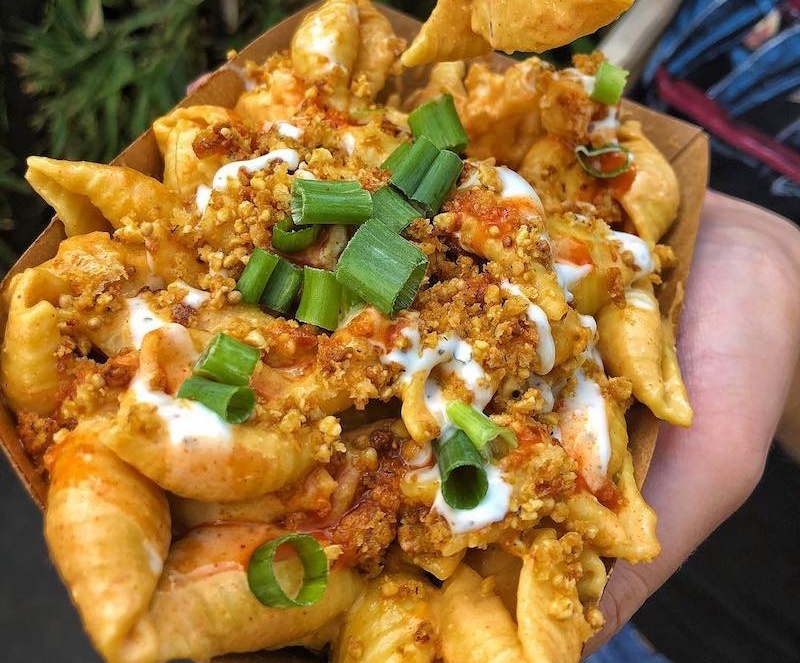 Double down on trends with the Buffalo Cauliflower Mac, featuring the company’s signature vegan mac and cheese, roasted cauliflower, bread crumbs, green onions, buffalo sauce, and Follow Your Heart’s Vegan Bleu Cheese. 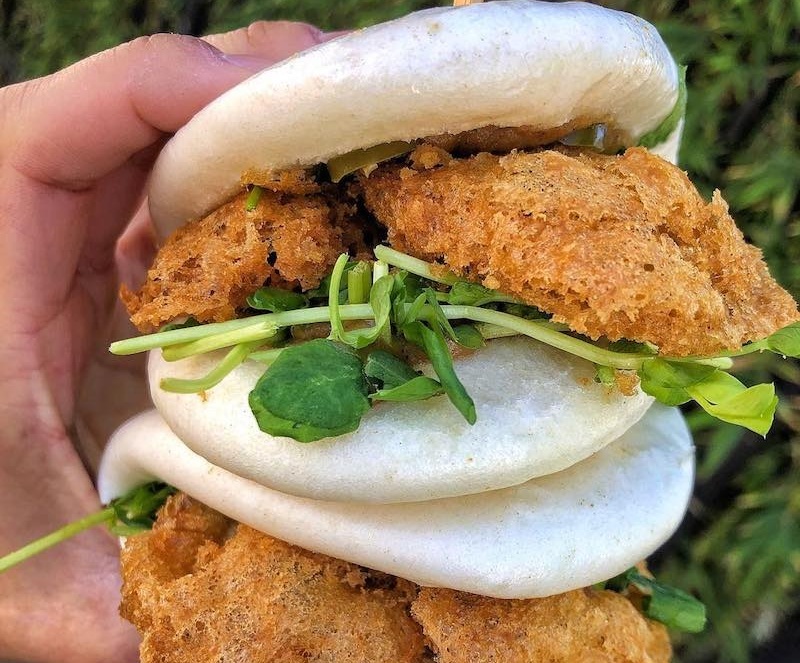 Show off your vegan buns on Instagram with this local pop-up’s Fried Shroom Bao. These traditional Asian snacks are stuffed with crispy organic king oyster mushrooms, sprouts, homemade hoisin, and roasted chili oil. Now those are good looking buns! This loud Los Angeles staple is known for its over-the-top fast-food inspired vegan menu, and it continues to innovate to draw a crowd at Vegan Street Fair. While you may be tempted to order the usual Mac and Cheese Bites or BBQ Black Bean Sliders, try something new to jazz up that Insta feed. Behold the Mashed Potatoes and Gravy Fried Chick’n Biscuit Sandwich. 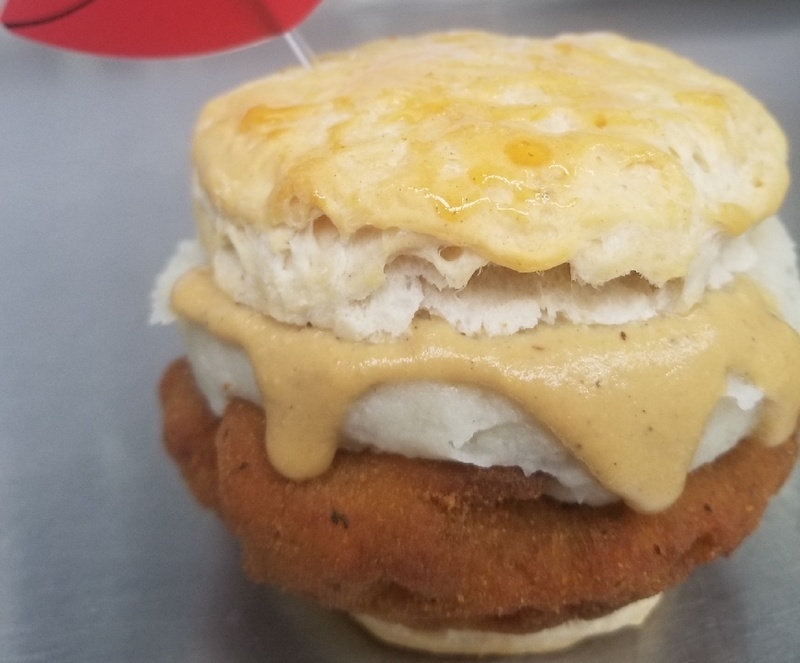 This beauty is constructed with a fried cauliflower patty and gravy-slathered mashed potatoes sandwiched between two buttery vegan biscuit buns. Go hard or go home. 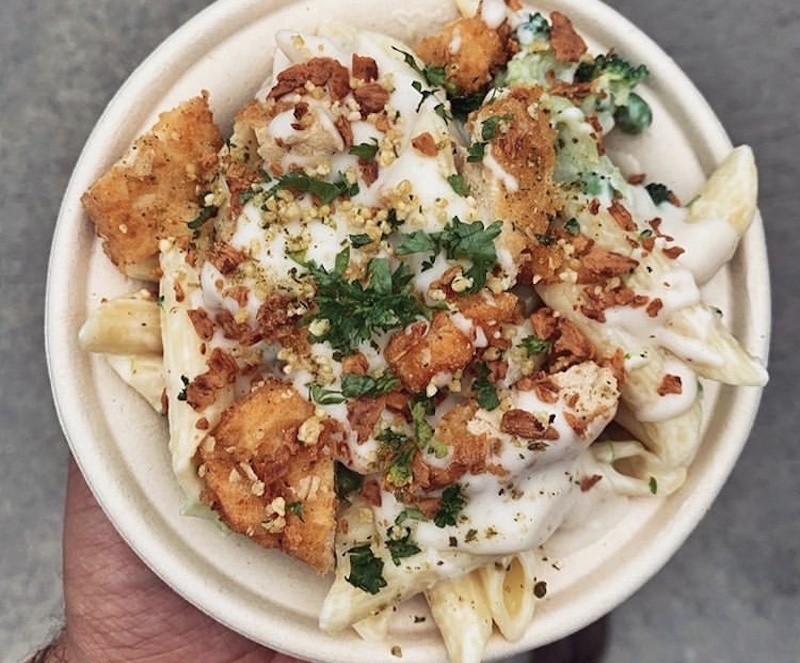 While pasta isn’t a traditional street food, Dank Vegan’s portable bowl of Dank Penne Alfredo might just change the game. Find yourself a sunny spot on the curb and snap a photo before taking a fork to this creamy dish of alfredo penne tossed with peas and broccoli and generously garnished with breaded chik’n, vegan bacon, and fresh herbs. This is your chance to try (and document) vegan Cambodian food. 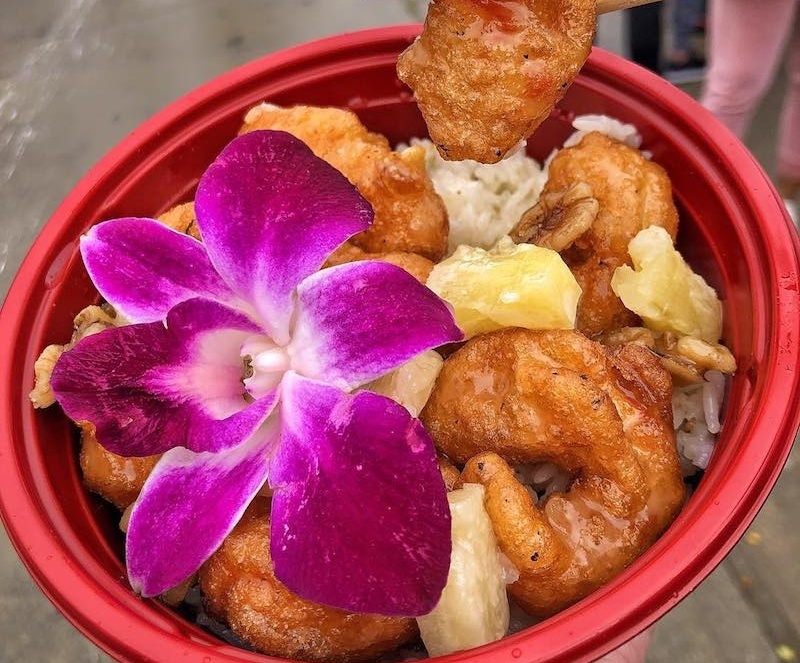 Order a spread of Egg Rolls, Beef Lok Lac (Cambodian beef salad), and a Pineapple Walnut Shrimp Bowl to sample all of the incredible dishes this unique vegan pop-up has to offer. Take a pic of the most creative vegan sushi you’ve ever had at Oono Sushi’s tent. 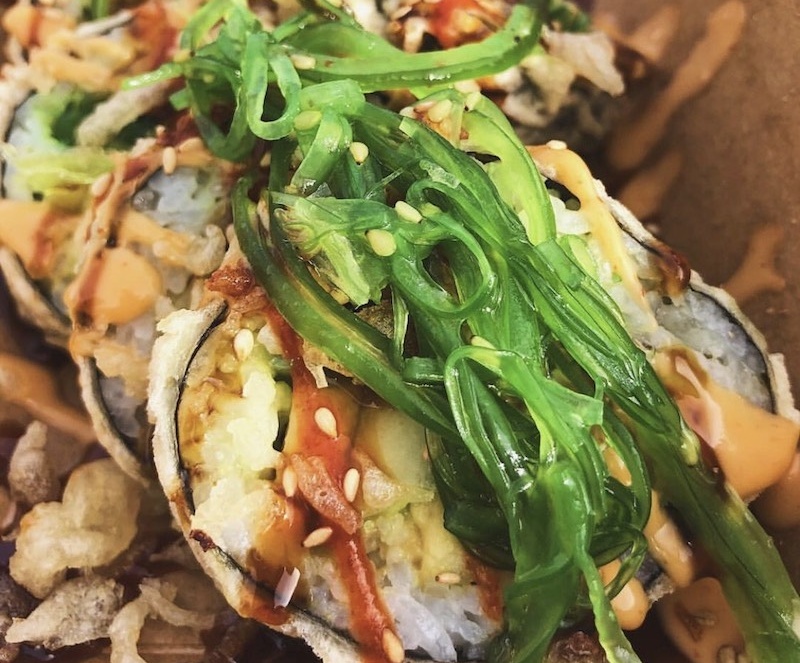 The menu features a variety of mouthwatering rolls and sushi burritos, but the bestseller by far is the Veggie Tornado Tempura Roll. Made with sushi rice, cucumber, avocado, and sweet tofu all wrapped in a crispy seaweed tempura and topped with seaweed salad, this roll will make your Insta feed pop! Warning: get in line early. This vendor will sell out. 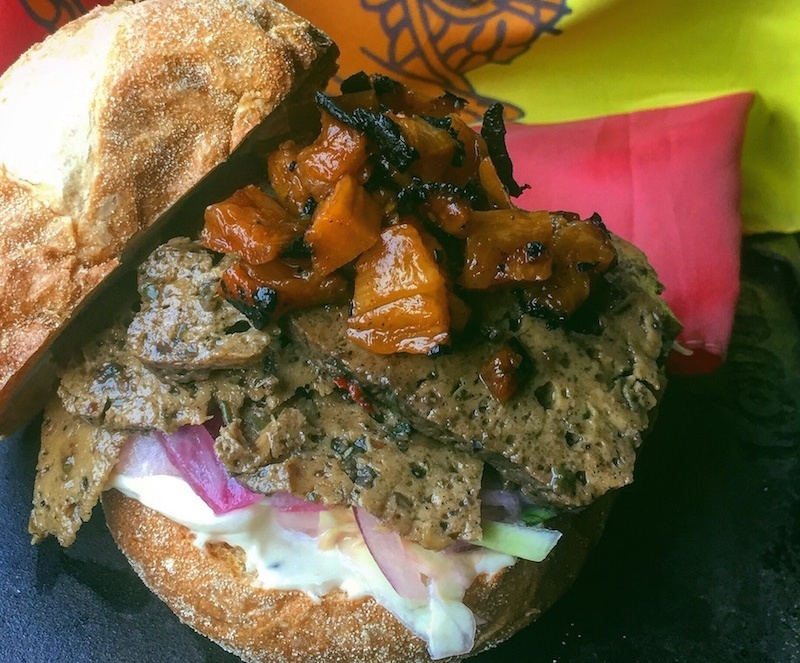 Monk’s Meat is traveling all the way from Brooklyn for its second year at Vegan Street Fair, serving up vegan smokehouse favorites for as long as its limited supplies allow. Even if you’re starving from waiting in a long line, resist the urge to take a bite of the Jamaican Jerk Seitan until you’ve documented it. The world needs to know about this delightfully realistic plant-based meat. 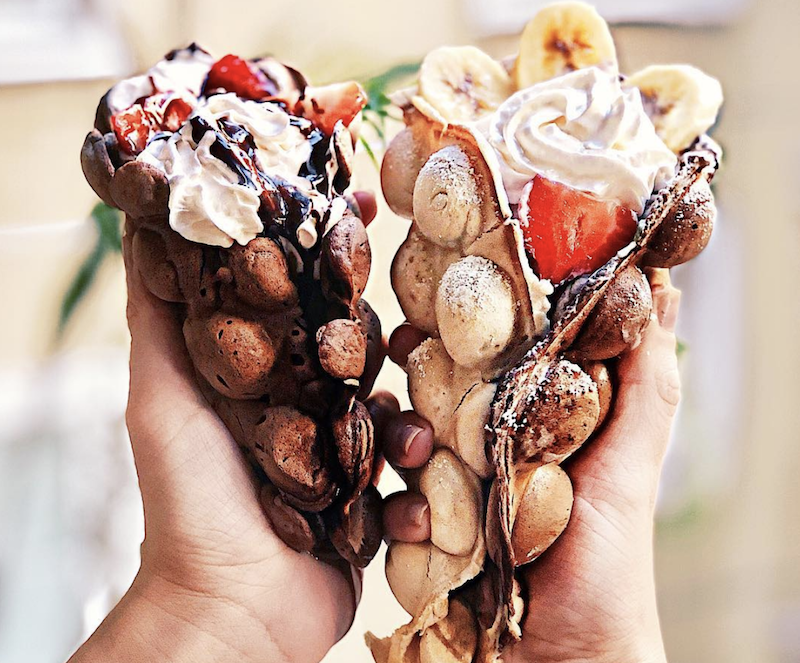 There are waffle cones, and then there are bubble waffle cones. Finally, a vegan version of this food trend exists! Choose from four flavors of puffy cones (cheese, vanilla, chocolate, or peanut butter) then go to town with the fillings. When you order the Loaded Vaffl, your options are limitless! Bring it on! Create-your-own is a major dessert trend; why not apply it to cinnamon rolls? 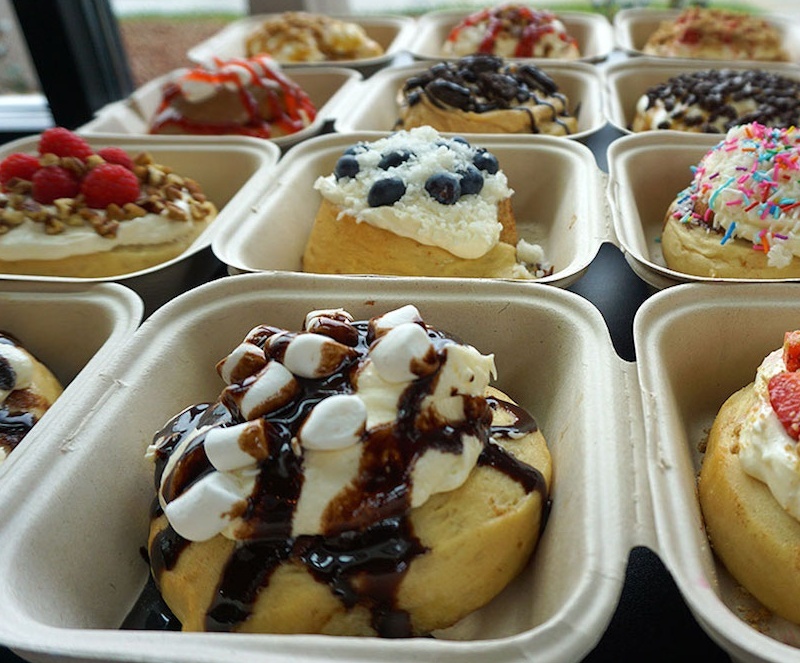 Grab a pic of your most epic vegan cinnamon roll creation with three frosting flavors and 10 toppings to choose from. Cookie dough on a cinnamon roll? Why not! Can’t decide between sushi and a burrito? Have both. 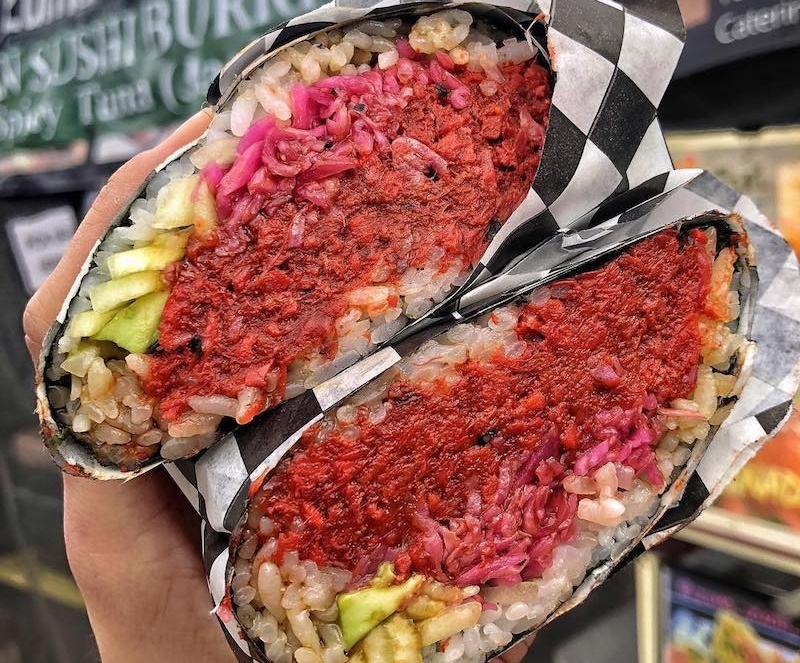 The Zumo Zuzhi Burrito tent will be serving up its popular Vegan Spicy Tuna Jackfruit Sushi Burrito made with sushi rice, “raw” vegan jackfruit tuna, avocado, cucumber, and pickled cabbage, all wrapped in a giant sheet of seaweed. Hold the salsa, bring on the wasabi. Vegan Street Fair’s slogan, “Eat all the vegan things,” definitely applies to Compton Vegan’s Jackfruit Ribz Plate. 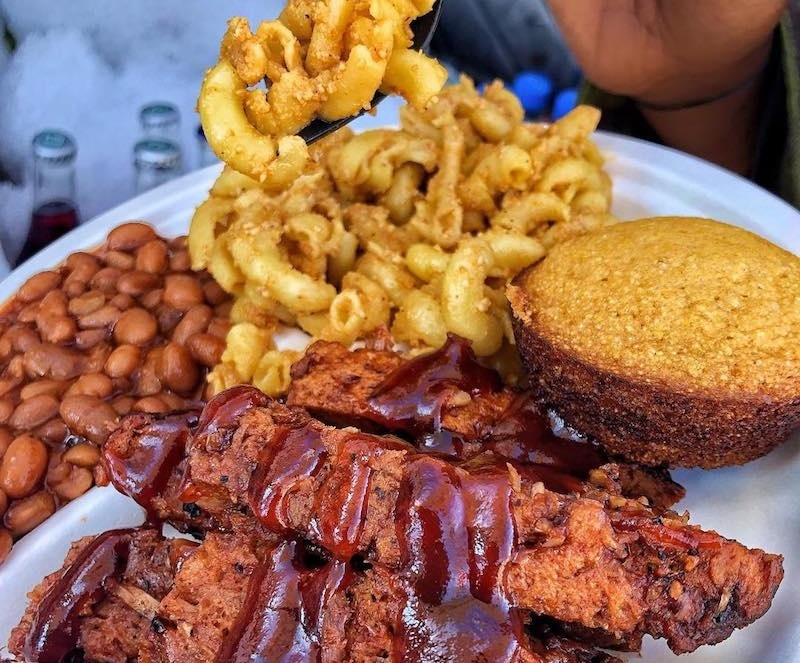 Customers get all the southern sides with this one order, including succulent seitan and jackfruit barbecue ribs, barbecue baked beans, cornbread, and mac and cheese. Don’t forget to hashtag #comfortfood! Don’t get up to Oakland too often? Now’s your chance to try (and photograph) the Bay Area’s favorite vegan Creole-inspired restaurant, Souley Vegan. 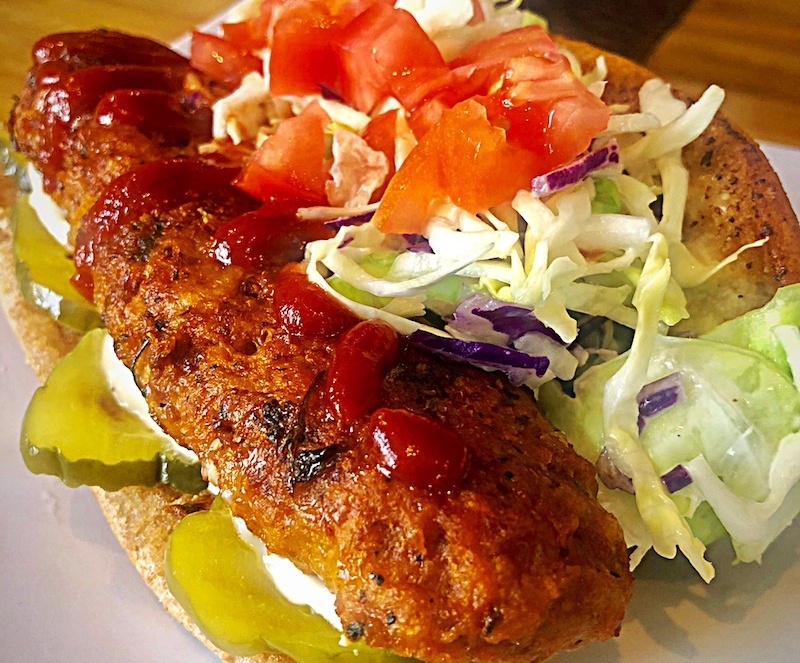 For the perfect picture, order the open-faced Seitan “Shrimp” Po Boy made with fried vegan shrimp, pickles, coleslaw, and swamp sauce. When it comes to tagging your location, this sandwich might inspire you to drop a pin in New Orleans!